Oil Based Hot Forging Lubricants offered are oil based lubricants and find use in deep cavity dies used for hammer forging. Its use helps in bringing reduction in smoke levels as well as consumption of gasses like ammonia in die. Some of the derived benefits of the product include enhanced die life in comparison to furnace oil/LDO used as forging lubricants, reducing ammonia gas consumption during nitriding process as well as in reducing costs involved in cleaning and rejection of forgings. Offering better surface finish of forged components, these lubricants are offered in 20 kgs/200 kgs special HDPE container packaging with a shelf life of 12 months in factory sealed conditions. This is one of the finest types of lubricants based on oil. 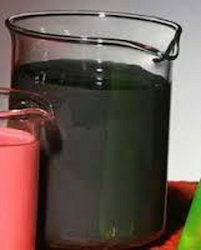 They are colloidal in nature and dispersion of graphite in oil. In general Oil Based Hot Forging Lubricants can be used by manual application because of the style of application process. They are initiating deep cavity dies for hammer forging. By the use they are reducing the amount of smoke in the application process and that is initiating the same. ESPON-DLO-V is also reducing the consumption of some gasses like ammonia in the die. Looking for Oil Based Hot Forging Lubricants ?